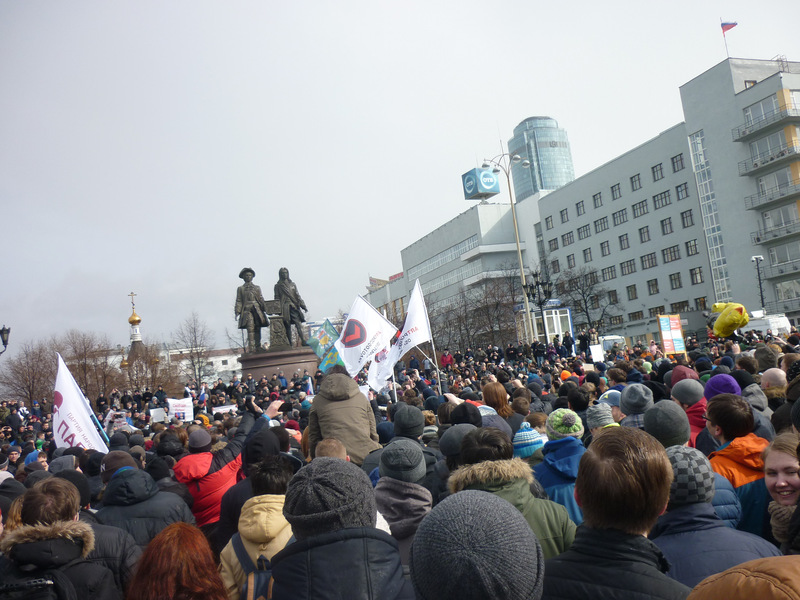 Anti-corruption rally in Yekaterinburg, Russia, 26 March 2017. The past decades have on the one hand been marked by uncertainty and conflict, and on the other by progress and successful cooperation. On a global level, poverty and starvation are gradually diminishing while, at the same time, new deadly conflicts have arisen in the Middle East and in Eastern Europe. Basic human rights and freedoms are being made available for many more, while the situation for so many show little sign of progress. So is the world a better place now than it was 25 years ago? In general, it is, but there are still many areas where the international community has a lot of work to do. At the OSCE Parliamentary Assembly summer meeting in Berlin, I hosted a seminar on the importance of fighting corruption in order to support the growth of democracy and transparency within the OSCE-area. From the point of view of a small country in the far north of the globe, the most efficient way to make a lasting change for the better is by strengthening and defending international institutions – it must be a top priority to deepen the cooperation between the member states of the OSCE. Combatting corruption in areas plagued by internal or international conflict, with a low presence of international institutions or NGOs, is a Sisyphean task – first and foremost, every member state of the OSCE must continue supporting international institutions promoting cooperation and peace. Sadly, international conflicts continue to plague the world, although the nature of these conflicts seems very different from those we have seen before. The past few years have been marked by military combat as well as cyber warfare and conflicts over information and truth itself. The common denominator for these sorts of warfare, is that they all carry corruption in their wake, and with it, a much weakened society. It is therefore of utmost importance that we undertake strong measures to prevent these conflicts at an early stage – not only for the sake of those directly involved, but also in order to safeguard democracy and openness. When the Berlin Wall fell, and when the Cold War came to an end shortly thereafter, we were many who saw an opportunity for new democratic and transparent states to emerge from the rubble. There are many examples that show us that our hopes were not in vain: countries such as Estonia and Slovenia have demonstrated that extraordinary change can be accomplished with the right leadership and vision. Countries that only a few decades ago suffered from cruel totalitarianism, such as the Czech Republic and Latvia are combatting corruption with extraordinary efficiency, and are today shaping the future of a democratic Europe. In other cases, our optimism has been tarnished. There are numerous examples of countries where the fight against corruption has stagnated, and in some cases even reversed. The governments of these states – Russia and Hungary, to name two – have stood passively by as corruption has been allowed to fester. The leadership in these countries lack a democratic and liberal vision, and are now sadly regressing to the authoritarian tendencies of the profoundly illiberal political systems that they so confidently rejected not many years ago. The consequences of a continued disinterest in corruption in Russia would, by means of population and military capabilities, be most dire. As their own work to prevent corruption has either been abandoned or failed, they have in the past years sought to destabilize more successful states. Fully democratic nations have been targeted, as seen in the U.S. 2016 election and in the tragic Salisbury poisoning of Sergei Skripal, but also – and perhaps even more worrying – developing democracies whose only crime is to move in the direction of openness and transparency. Eastern Ukraine has turned into a veritable war zone, and the consequences for the people of the region, for the Ukraine as a whole, and for the future of Europe, are unforeseeable. The citizens living in this region are victims not only of war but of all the consequences that comes with societal collapse. If we allow this aggression to continue, we would signal a tolerance of international violations and authoritarian rule. When democracy and transparency dies, the first victims are the most vulnerable groups of our societies. With a weakened rule of law, the integrity and freedom of the individual are diminished. We see that persons who belong to the LGBTQI community suffer from populist and reactionary policies, and that national minorities in large parts of Europe are victimized by growing nationalist and chauvinist sentiments. The only viable response to this highly problematic turn of events is to continue the fight for transparency, democracy and a strong and independent rule of law. On many levels, Europe of today stands before a fateful choice. Do we choose to follow the path that has led us to prosperity and openness, or do we take the road of regression, towards division, resentment and authoritarianism? If it were up to every nation to make this choice, the authoritarian ideals steering towards corruption and conflict would surely be replaced with those of democracy and openness. But sadly, autocrats without constructive and responsible solutions to corruption and mistrust choose to disregard individual freedoms, human rights and transparency, and instead use their power to harass neighboring states and minorities. This is a cynical, shameless strategy that contradicts the principal values of the OSCE Parliamentary Assembly. We must therefore continue to firmly oppose every attempt to delay the long journey towards global democracy, and we must never flinch in the fight against authoritarianism and corruption. Margareta Cederfelt is a member of parliament from Sweden and Vice-President of the OSCE Parliamentary Assembly.